By Hilary Clark | After a strenuous three-and-a-half hour hike, I reach the top of Telescope Peak, Death Valley’s highest point at over 11,000 feet. I watch the sun set over Mount Whitney to the distant west. To the east, I see the expansive shades of desert brown. Bristlecone pines surround me like twisted works of art. I feel a sense of gratitude to those who fought for conserving our public lands. Had Death Valley and other national parks not been first established as national monuments, they may never have been protected. I thought of the many national monuments that I had seen: ancient cliff dwellings and vast volcanic fields out west to the marine ecosystems and historic sites back east. 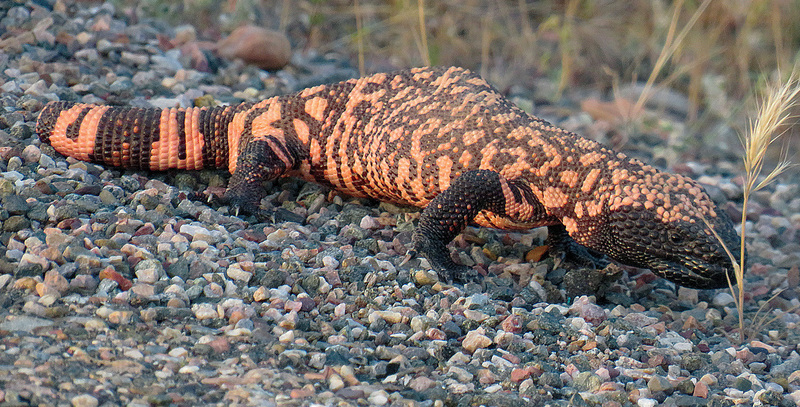 Photo above: Gila Monster in Tonto National Monument, AZ. Photo by Hilary Clark. These sites don’t have the iconic reputations of Grand Canyon, Yosemite, or Yellowstone. Yet, they have the power to unite people from disparate backgrounds and differing beliefs. There are over 140 national monuments that range from historic icons like the Statue of Liberty in New York to natural wonders like Giant Sequoia National Monument in California. The Statue of Liberty was a gift to the United States from France in 1886. It still serves as a universal beacon of democracy and freedom for immigrants who first come to America’s shores. While some monuments serve as historic symbols of resilience and hope, others preserve towering trees that reach the height of sky scrapers. On May 19, 1945, four years after the attack on Pearl Harbor, delegates representing forty-six nations gathered at Muir Woods National Monument in California for Franklin Delano Roosevelt’s memorial service. During a time of war and turbulence, they found peace and humility under the towering redwoods. Secretary of Interior Ickes said to those at the service: “. . . Muir Woods is a cathedral, the pillars of which have stood through much of recorded human history . . . ” Franklin Roosevelt had a dream of planting a corridor of trees across the nation, which was never realized. It was his distant cousin Teddy Roosevelt that had set Muir Woods aside in 1908. Bristlecone Pine at Telescope Peak in Death Valley National Park, CA. Photo by Hilary Clark. Even though Teddy Roosevelt was a New Yorker, he always felt a special affinity for the west and was particularly interested in science. Both he and naturalist John Muir recognized that natural and cultural resources were dwindling at an alarming rate. They differed in their views on how to protect them; Muir was a preservationist who believed nature should remain untouched, whereas Roosevelt was a conservationist who advocated for sustainable use of resources. Muir had Roosevelt’s undivided attention in a camping trip in Yosemite in 1903, where he impressed the president with his knowledge of botany and geology. Historians believe that this trip with Muir influenced Teddy Roosevelt to add more acreage to Yosemite National Park. Three years after his Yosemite trip, Teddy Roosevelt was the first president to use the Antiquities Act of 1906 to establish Devils Tower National Monument in Wyoming. This Act gives the president the authority to establish national monuments by Executive Order, providing an important vehicle to protect both natural and cultural sites. The movement to protect both stemmed from the idea that these sites preserve our national heritage. They tell us about our past in the same way that studying and learning about different cultures gives us a broader understanding of ourselves. Teddy Roosevelt used this Act to establish many national monuments including a total of eighteen in Arizona, which boasts more monuments than any other state, Grand Canyon being the most famous, along with Petrified Forest, Montezuma Castle, Tonto, and many more. Many of the first monuments established were ancient cliff dwellings that date back to the 1100s and still remain intact. Even though these sites were set aside for cultural reasons, they also help protect wildlife habitat. Tonto National Monument, located in Roosevelt, AZ, is only a little over 1,000 acres but is home to javelina, mountain lions, foxes, a diversity of birds, and even Gila Monsters. The stories of those who advocated for these sites are as inspirational as the sites themselves. A former Southern belle, Minerva Hoyt, developed a passion for Joshua trees during the 1930s. After the sudden and devastating loss of her husband and son, she traveled to the Mojave Desert in search of solace and peace. She also found her calling. Joshua trees were being cut down at an alarming rate, used for everything from firewood to decoration. One botanist referred to them as the “ugliest plant in the vegetable kingdom.” Minerva Hoyt saw beauty in these twisted, Dr Seuss shaped, trees that were not actual trees, but members of the yucca family. She traveled around the country to Boston, New York, and as far away as London, with exhibits about the Joshua trees. She wrote letters and got the attention of President Franklin Delano Roosevelt. Secretary Ickes, who would later speak under the towering redwoods at Roosevelt’s memorial service, became convinced that Joshua Tree should be set aside. In 1936, Joshua Tree National Monument was established following on the heels of Death Valley, which was set aside in 1933. Today, a mural of Minerva Hoyt graces the Joshua Tree National Park Visitor Center. Lower Cliff Dwelling in Tonto National Monument, AZ. Photo by Hilary Clark. Almost 60 years later, the California Desert Protection Act was passed in 1994, converting Death Valley and Joshua Tree into national parks and establishing the 1.6 million acre Mojave National Preserve. These desert areas provide important habitat for wildlife ranging from bighorn sheep, mountain lions, bobcats, kit foxes, and more. Would we have these areas today without the Antiquities Act of 1906? The debate over the use of the Antiquities Act continues, and the future of America’s national monuments is uncertain. Rather than focusing on the divisiveness of opposing views, national monuments can become places of self–reflection and inspiration. Whether it is a monument to Civil Rights or long-lived trees that dwarf human life, these sites give us a sense of humility about a world much larger and longer lasting than our own lives. In this sense, public lands can serve as places of common ground that can unite people and perhaps help heal a divided nation. Hilary Clark is an avid outdoor and public lands enthusiast who has worked out west as an environmental educator. She lives in the Mojave Desert and enjoys hiking, biking, and kayaking in her free time.